He has grilled satay in a Malay restaurant and sold radio advertising. And, right now, Mr Sim Hong Huat, general manager of Singapore Press Holdings (SPH) Radio, is getting ready for a new challenge: launching a business and personal finance radio station, the first of its kind in Singapore. We chat in his office at SPH’s News Centre building in Toa Payoh and there are four guitars lying about. 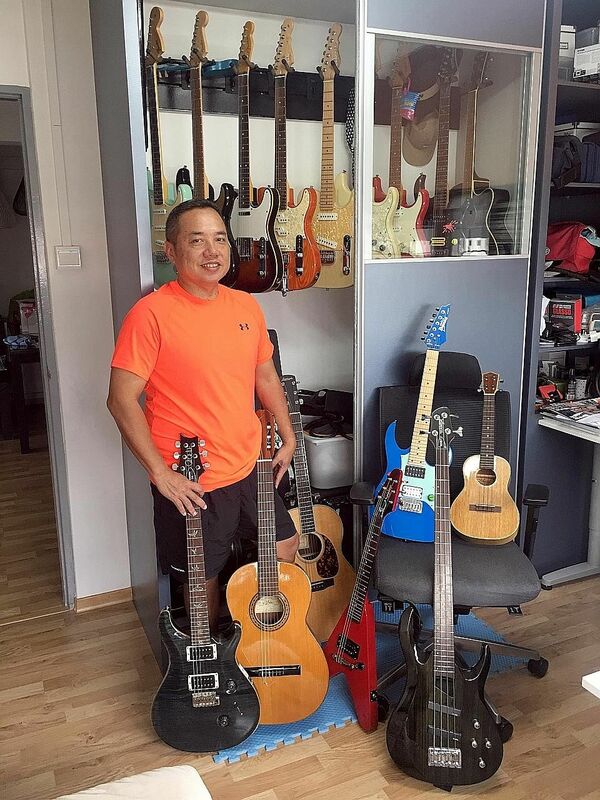 Mr Sim is a bedroom strummer with a large collection at home. The guitars in his office are for autographs. Musicians dropping by One FM 91.3, Kiss92, UFM 100.3 and the just-launched 96.3 Hao FM for interviews are apt to be stopped, handed a marker and asked to scribble something on the instruments. “I have Nathan Hartono, Tanya Chua, Def Leppard, Journey,” says Mr Sim, 48. He also has signatures from Taiwanese rock duo Power Station. “I get signatures because I’m a fan,” he says. The turntable in his office is flanked by records from blues legends B.B. King and Eric Clapton, both masters of the six-string. The man who joined SPH radio in 2012 as head of the sales department, just after the launch of Kiss92, has just overseen the launch of 96.3 Hao FM. The Mandarin station is targeted at bilingual Singaporeans aged 45 and above and plays classic Mandopop tunes. It also features programmes on lifestyle, healthcare and financial planning. He is watching the performance of the Chinese station closely, while overseeing the launch of Money FM 89.3, slated for Jan 29. I like being the underdog. When Kiss92 came along, the competitors brushed it off. But when you are the underdog, there is a lot of room up there, there’s a lot of money in it, because the leader is resting on his laurels. And that was what happened. Presenters have been hired and programme formats finalised for the 24-hour station, he says. Right now, presenters and producers are in rehearsal mode, pretending to be “live” and working out the kinks. “Each piece of content is measured in seconds and we have to fill 24 hours. It can get scary,” he says, giving a sense of scale to the task in front of the team, asked to fill airtime with a lot of talk – high-quality, money-focused talk – and very little music. Plans for a talk-heavy business station had been drawn up years before and SPH’s radio arm had been waiting for the right time to launch it. The moment came last year when frequencies were released by the Info-communications Media Development Authority (IMDA), leading to SPH winning a tender for two of them. One would be for 96.3 Hao FM, launched last week, and the other for Money FM 89.3. 96.3 Hao FM specialises in Mandarin pop from the 1980s and 1990s, while Money FM 89.3 has been positioned as the first and only business and personal finance radio station in English. “We had done research and knew that there was a need for a business and finance station. We looked at what we can do best that others can’t. We saw that nobody has better resources and expertise in reporting business news,” he says. The station is aimed at professionals, managers, executives and business people (PMEBs). It will draw on the expertise of the presenters, guests and business journalists, mainly from The Business Times. During the morning drive-time hours, for example, Money FM 89.3 will feature a panel format with guests and banter, similar to its sibling stations. What sets the business station apart is content: It will give listeners a deeper dive into money topics and will not shy away from getting into details. While the mood will generally be serious, the exact tone will depend on the chemistry between the hosts, producers and guests, he says. “The tricky thing about radio shows is that each one is driven by the personalities and we want them to be themselves. For example, on Kiss92, Jason Johnson is the goofball and Arnold Gay is the news guy, the fact-checker, and you have Maddy Barber, who’s very bubbly,” he says. Their show sounds smooth and natural now, but it took a couple of years for the roles to settle, and Mr Sim expects the same bedding-in period for the Money FM 89.3 morning team. Experienced presenters Claressa Monteiro, Yasmin Jonkers, Elliott Danker and Howie Lim have joined. There is one more presenter, but he cannot reveal the name yet for contractual reasons. One thing is certain for Singapore’s first business and finance station: It will not adopt the monotone of the standard radio news reader. “We ask the presenters to imagine that they are talking to a 40-year-old mid-career male who drives a car. He might live in an executive condo and have a five-year-old kid. We drill down into it and it helps the presenters deliver,” he says. The morning show will also feature guest experts to talk about everything from bitcoin to property and The Business Times’ journalists will also be brought in, says Mr Sim. The more light-hearted features of shows on other stations, such as games or chats with music artists, will be omitted. Listener phone calls will be a highlight of Money FM 89.3’s morning and evening shows. Every call will be screened, as is standard practice. But the station’s producers will be setting the bar higher in the search for callers who can take discussions forward, he says. “It’s going to be a challenge for the producers to get callers with good, strong opinions,” he says. The journey to SPH Radio began for Mr Sim in school, when he was tuned into 1980's Britpop, then coming from Singapore's single English radio station, Radio 1. The son of a taxi driver and housewife, and the middle one in a family with five children, he did not have much pocket money to buy things he liked, such as music magazines and guitars. He went to Tanglin Primary School (which does not exist any more) and scored well enough in the Primary School Leaving Examination to go to Raffles Institution (RI). To pay for magazines and cassettes, he worked at restaurants, flipping pizzas, cooking french fries and, once, manning the satay grill station at a Malay restaurant. The family moved about, from a three-room flat in Queenstown to a four-room one in Toa Payoh. Along the way, he hung out with friends, played rugby for RI, took pop and classical guitar lessons and was a fan of everything from synthpop band Duran Duran to heavy metal and Cantopop. He jokes that they let him into RI by mistake because he was anything but studious. He did not have the O-level results to join most of his cohort at Raffles Junior College (RJC) and took his A levels privately. That opened the way to the National University of Singapore, where he studied economics and sociology. Naturally, he played guitar with friends from Eusoff Hall, where he stayed. Graduating in 1995 and inspired by notions of being his own boss, he became an insurance agent, but that left him jaded. He took up a job in advertising sales at the Radio Corporation of Singapore, the predecessor to Mediacorp Radio. He left in 2000 to join a telephony company then pioneering the sale of Internet-based voice calls, before returning to Mediacorp in 2003. He later struck out on his own to co-found a company selling advertising on Chinese search engine Baidu. Then, in 2012, the post of sales director at the radio arm of SPH became vacant. He was recruited to multiply revenue, which he accomplished by re-training, re-organising the sales force and recruiting experience salespersons. Net profit grew from just under $200,000 around the time he joined to $2 million the following year and the figure has grown further since. In 2014, he was promoted to deputy general manager and, later that year, made general manager. Mr Ang Chek Meng, 48, is second violinist with the T'ang Quartet, which was formed in 1992 and has since become one of Singapore's premier classical groups. He and Mr Sim have been friends since Secondary 1 at RI. They used to hang out at Far East Plaza and Centrepoint and, these days, they meet other former classmates for drinks regularly. "He enjoys mixing and talking to people. He's a genuine person, has no airs and is easy to get along with," says Mr Ang. Not going to RJC with his buddies was a setback, but he bounced back and that is who he is, he adds. Married since 2004 to freelance graphics designer Jenny Poh, Mr Sim has a nine-year-old son, Elliott. One room in his Marine Parade flat is given over to his collection of 20 stringed instruments, mainly guitars, but also including ukuleles. They are not wildly expensive, he says; there are no $100,000 vintage models here. He collects mid-priced instruments, costing $5,000 or less, that hold a special significance for him or which feel and sound right when he tries them in the shop. Launching two new stations in a media landscape that has seen massive change from the time he joined the industry in 1997 holds no terror for him. After all, he has helped to make Kiss92 a major player and sold Internet-based telephone services and search engine advertising. Mr Sim says he enjoys creating tailored products for specific audiences. "When it comes to advertising, it's not about numbers. You could reach out to a million listeners, but it might be the wrong environment, with the wrong message. "But if you have the precise message sent to the right 1,000 people, they become customers of your brand."